So says the ominous on-screen crawl when you begin watching Hostile Intent. On the bright side, at least we have until the year 2000 until the world goes to hell. So when a team of computer nerds/paintball nerds decide to go off in the wilderness to celebrate the completion of their newest program - and people start getting shot and actually dying - this paint-soaked excursion just got real. Mike Cleary (Lowe) is the head of the research team who have come up with a Lifelock-like computer program that can protect your personal files and documents. Naturally, this leads to an all-out massacre where innocent geeks are getting machine-gunned and machete’d to death. Cleary teams up with unfriendly forest-dweller Bear (Savage) - who predates the rise of Bear Grylls by many years - to defend themselves against the murderous goons of Kendall (Rubinek). Sure, these “hackers” think they’re smart, but can they decipher the intent of the baddies...their HOSTILE intent? (Don’t bother to) find out today! Rob Lowe must really have been hitting the skids to make this piece of crud. He seems miscast as a computer nerd, though because it was the 90’s he wears a flannel shirt when he goes to the “Dotcom Cafe” which evidently is (or was) a real place. 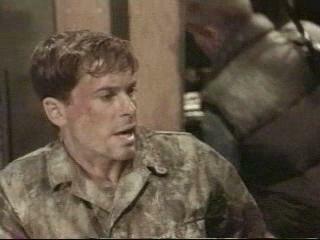 His character, Mike Cleary, takes life - and paintball - REALLY seriously. Before people even start getting killed, he treats it like a life-and-death military operation. Try as he may, Lowe can’t save this movie. Though he has help from Savage and Rubinek, great actors both, ANY actor would be at a loss when faced with the overwhelming dumbness of Hostile Intent. When the item that’s causing all the bloodshed is something called a “Clipper Chip” (which we believe may be a kind of boat), it may be time to pack it in. A lot of the so-called action isn’t really explained, so the viewer starts to lose patience quickly. Members of Cleary’s team such as classic mustachioed fat guy Soames (Del Grande) and token woman Gina (Shinas) - who was in Ripper Man (1995) - don’t serve to make things any Clearyier. But on the bright side, there are a lot of 90’s computers and references, so anyone with a fondness for 90’s nostalgia, especially as it relates to outdated technology, will have a field day here. But back in the day, who actually rented this? 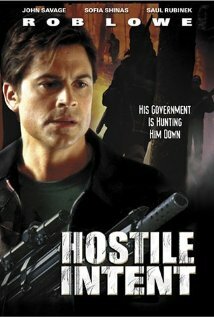 Hostile Intent is the type of movie you rented at your local video store when your first 25 choices were rented out. Also, the very last credit at the end of the movie is a dedication to someone named “Pastebucket McWoo”. It’s a shame the only funny, interesting, mysterious and intriguing thing about the whole movie was left for dead last, one second before the movie totally ends. Pastebucket McWoo, we hardly knew ye. Featuring no title song whatsoever, Hostile Intent is a new Lowe. "In the time-honored pantheon of “Paintball Gone Wrong” movies, Hostile Intent has to rank somewhere towards the bottom of the list." Classic. I never even knew there was a "paintball gone wrong" genre until I read this review. Thanks for the review, it's more fun than it seems the film was. You're welcome! Happy you enjoyed the review. Masterblaster is another classic "Paintball Gone Wrong". 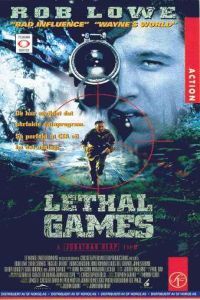 One of the few action movies I have not been able to finish. Hard to believe Manny Coto, who directed Dolph in the solid Cover Up (1991), ended up writing this slog. Favorite Paintball Gone Wrong scenes: Friday The 13th Part VI. This is a tough sit...we completely understand you not finishing this. Haha. I thought this film was OK, i'm a sucker for Lowe films. We wished this was better...Lowe was ok, but the plot has been done countless times...and done better.